Frankincense Essential Oil is steam-distilled from the gum resin of the Boswellia tree. It contains the naturally occurring constituents monoterpene and sesquiterpene, and boswellic acid is high in the gum resin. You really should look those constituents up to learn how beneficial they can be! 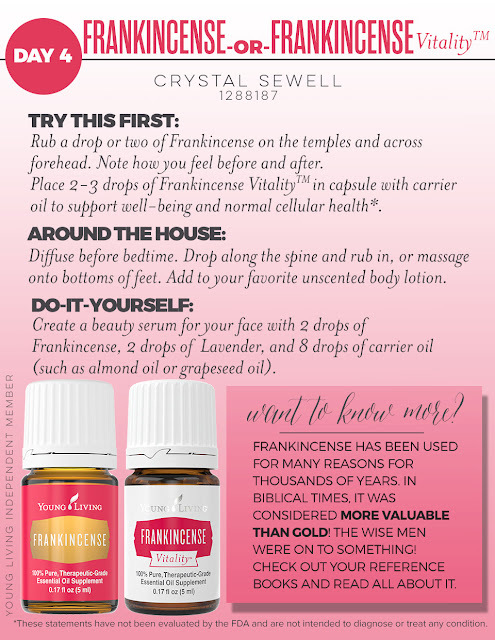 Frankincense Essential Oil is in my homemade facial moisturizer that I apply after washing my face in the morning and evening. I love the calming aroma of Frankincense and after a hard day I love to add a few drops to my diffuser or even to an Epsom Salt bath. I encourage you to do a bit of your own research into all the wonderful benefits of Frankincense! Not a Young Living Member, yet? Click HERE to get started!